More than a dozen monks, striking garment workers and journalists were beaten Thursday by members of the elite 911 paratrooper unit armed with batons, steel pipes and even slingshots during a bloody clash outside a Phnom Penh factory where a few hundred protesters gathered to demand a hike in their monthly pay. Human rights groups said at least four monks and 10 other protesters detained at the scene were still held by the military as of Thursday evening. Another monk and one woman were being treated for their injuries at the Khmer Soviet Friendship Hospital. Thursday’s violence followed after protesters arrived at the gates of the Yakjin factory off National Road 4 hoping to convince workers inside to join their demonstrations for a $160 monthly minimum wage for garment workers. According to witness accounts, the clash began when one of a group of soldiers stationed outside the factory, from the military’s Brigade 911 Airborne unit, which is headquartered nearby, threw a water bottle toward a monk who was with the protesters. Angered by the rude gesture, some of the protesters began throwing stones at the troops. The soldiers responded by attacking the protesters, monks and photographers with batons and steel pipes. “It is brutal how the soldiers beat up the monks and workers. Soldiers have to protect the nation, not fight the workers,” said Seng Heang, a Yakjin worker who jointed the protest. Tens of thousands of garment workers have been protesting and striking for the past week to demand that the government raise their monthly minimum wage to $160. An offer from the Labor Ministry to raise the minimum wage to $100 has been rejected as too little. Thursday’s clash was by far the most violent to date since the strikes began. Major Sophorn is a relative of the commander of the 911 Brigade, Chap Pheakdey, who could not be reached for comment on the deployment of his unit. Brigadier General Sum Samnang, deputy commander of Airborne 911, also declined to say why members of the elite unit were deployed to protect a private factory. He did say, however, that his troops only used force in response to violent protesters. “A group of these people stormed the factory. I don’t know who they are,” he said. Brig. Gen. Samnang said he did not know how many people were injured or detained by his troops, but he said they were being held at the paratroopers’ headquarters under the authority of the military Police. Rights groups condemned the violence, in particular the use of an elite military unit against protesters. “The use of Special Command Unit 911 to suppress demonstrations near Yakjin factory in Phnom Penh’s Pur Senchey district is unprecedented and signals a disturbing new tactic by authorities to quash what have been largely peaceful protests,” Licadho and the Community Legal Education Center (CLEC) said in a joint statement. They called on authorities to immediately release anyone they detained Thursday solely for organizing or participating in the protest, or to charge without delay any of them suspected of a crime. Rights group Adhoc called for the release of all those detained without conditions and urged the government to prosecute authorities for their role in the clash. Clashes also broke out at the Canadia Industrial Park—also in Phnom Penh’s Pur Senchey district—where military police squared off against thousands of protesting garment workers in the afternoon, said Bun Van, head of the Coalition of Cambodian Apparel Workers Democratic Union. Brigadier General Kheng Tito, spokesman for the National Military Police, said his officers had to intervene to protect the industrial park from the protesters. Brig. Gen. Tito said he did not know how many people were injured or detained at either site or when those detained would be released. “You can come to see yourself,” he said. Prum Sokha, a secretary of state at the Interior Ministry, also defended the military response to the protester at the Yakjin factory and the military police at Canadia Industrial Park. “Some protesters don’t respect the law and intimidate us and we got complaints this afternoon from the Embassy of Japan,” he said. “They made an official complaint about radical protesters—they used the word radical—who intimidate us. Takayoshi Kuromiya, second secretary at the Japanese Embassy, denied that the embassy had any communication with the country’s security forces Thursday, or called for the suppression of “radical” strikers. “No, today we did nothing. We are closed,” he said. On Thursday morning, another group of more than 200 garment workers protesting for higher wages blocked traffic in the south of Phnom Penh on National Road 2 for a little more than two hours in Meanchey district. Though traffic backed up for a few kilometers to the north and south, leaving hundreds of motorists stuck, police did not respond. Before calling off the roadblock, the protesters said they would return to the spot this morning. Approximately 100 garment workers also blocked National Road 5 Thursday for five hours in front of the Dai Young factory in Phnom Penh’s Russei Keo district. A few district and intervention police monitored the protest, which remained peaceful until it dissolved at around 2 p.m. Speaking to a few hundred party supporters at Freedom Park Thursday afternoon, opposition CNRP President Sam Rainsy condemned the day’s violence by soldiers and police and accused 911 commander Chap Pheakdey and his relatives of holding shares in garment factories and acting to protect their investments. “So Chap Pheakdey and Chap Sophorn brought forces from the parachute unit to fight the workers because they want to keep their $1 million,” Mr. Rainsy told supporters in Freedom Park. Amid all the protests, the country’s six leading nongovernment-aligned unions met Thursday morning to plan their next move. They decided to give the Labor Ministry and the Garment Manufacturers Association in Cambodia (GMAC) until Saturday to agree to resume minimum wage negotiations or face a surge in protests outside garment factories across the country. 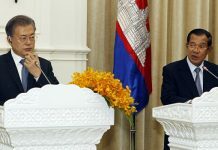 “Our workers will still continue to protest for the next [two] days, but if the Ministry of Labor [and GMAC] do not find a solution for us we will prepare mass demonstrations and marches across the country,” said Morm Nhim, president of the National Independent Federation Textile Union of Cambodia, which joined the meeting. Mr. Nhim also rebuked authorities for their heavy-handed response to the day’s protests. “Workers are now protesting everywhere because they are very angry after the soldiers used violence and arrested them. The government did not find a peaceful way to solve the problem and instead used force to take action against the protesters,” he said. For its part, GMAC sent Labor Minister Ith Sam Heng a letter Thursday accusing the protesters of damaging “most” of the more than 400 garment factories around the country in the past few weeks and repeating its vow to keep the factories shuttered until the unions and government could guarantee their safety. The combination of strikes and shutdowns have effectively crippled the country’s largest export industry, which generated some $5 billion in revenues during the first 11 months of 2013. 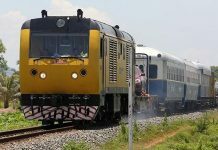 The Labor Ministry on Tuesday sent out its own letter to the CNRP complaining about “some groups” of violent protesters claiming to be members of the opposition party. It asked the CNRP leadership to confirm that those groups did not come from its ranks. In a reply to the labor minister Thursday, CNRP spokesman Yim Sovann did just that. 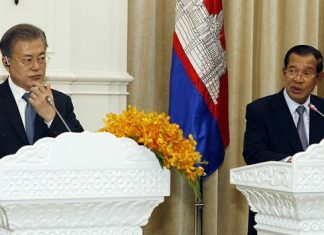 “The CNRP has been demonstrating to demand justice and a re-election nonviolently and peacefully, and we also respect morality and have never used violence to solve the problem,” he said.